Democrats Hillary Rodham Clinton, Barack Obama and John Edwards have proposed vast policy programs costing billions of dollars. Republicans Rudy Giuliani, Mitt Romney, John McCain and Fred Thompson have vowed to extend President Bush's tax cuts and continue the multibillion-dollar wars in Iraq and Afghanistan indefinitely. 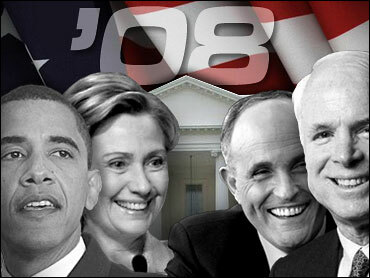 The top candidates on both sides of the 2008 U.S. presidential contest have shown their eagerness to spend tax dollars. But their priorities reflect widely differing views of the role of government in addressing complex problems. Clinton, Obama and Edwards have embraced ambitious government programs to help provide health care and education and to conquer global warming. For the most part, Clinton and Obama have offered specific ways to fund their proposals, while Edwards has argued that running a modest federal deficit is acceptable if it means investing in health care and reducing poverty. Giuliani, Romney, McCain and Thompson promote tax cuts and the need to rein in federal spending. They frequently deride their Democratic rivals as big spenders, but are themselves reluctant to say what they would cut to pay for tax cuts and U.S. military engagements. Paul Weinstein, an economist at the centrist Progressive Policy Institute, argues that candidates of both parties need to adjust their rhetoric if they are to be taken seriously as responsible fiscal stewards. "Democrats need to talk about budget cuts first - not just things like closing corporate loopholes, but specific programs they would cut to have the money necessary for other things," he said. "Republicans need to 'fess up' about the fact that under the Republican leadership of the last six years, we've cut taxes but we've also spent more and not managed our books. Low taxes are important for growth but we also have to make a reasonable attempt to trim government." Clinton's latest proposal, a $1 billion paid family leave program outlined Tuesday and financed by eliminating some tax shelters, comes atop several other major costly social programs she's outlined recently. But the New York senator isn't the only Democrat advocating major new federal initiatives. Obama and Edwards also have laid out multibillion-dollar programs on health care, energy independence and tax fairness. Health Care: Clinton, Obama and Edwards have outlined major health insurance plans with the goal of providing universal coverage for all. Obama has estimated his would cost $50 billion-$60 billion per year, while Clinton and Edwards say theirs would cost closer to $100 billion annually. All say they would pay for the plans largely by allowing Bush's tax cuts to expire on schedule in 2010. Energy: They have proposed expensive initiatives to reduce the reliance on fossil fuels. Clinton wants to create a $50 billion "strategic energy fund" to develop new sources of fuel and has proposed paying for it by eliminating tax subsidies for oil companies. Edwards has outlined a similar program and would eliminate the oil company subsidies as well as establish a cap-and-trade system requiring companies to pay for emitting pollution. Obama has pledged a 10-year, $150 billion program to produce "climate friendly" energy supplies. To pay for it, he would implement a 100 percent carbon auction where businesses would have to bid competitively for the right to pollute. Tax Relief: Obama and Edwards want to shift the income tax burden. Edwards' $25 billion per year plan would cut middle-class taxes by raising the capital gains rate on people making more than $250,000 per year. Obama's plan, projected to cost $85 billion a year, would be funded by raising the capital gains rate and closing some corporate tax loopholes. Retirement: With Social Security projected to run out of money in the next 40 years, Obama and Edwards say they would consider increasing the level of income that is taxed to provide benefits. To fund the system, the government currently assesses a 6.2 percent tax on incomes up to $97,500. Clinton has refused to say whether she would support that idea. But to address the issue of retirement security, she recently rolled out a $25 billion-per-year program to help individuals set up plans by offering a federal match of up to $1,000 per person. She says she would pay for the plan by freezing the estate tax at 2009 levels. Iraq War: Giuliani, Romney, Thompson and McCain say they favor a protracted military presence in Iraq, requiring tens of billions of dollars of continued spending. The U.S. currently spends about $10 billion a month in Iraq and nearly $2 billion a month to fight terrorism in Afghanistan and elsewhere. Tax Cuts: All four would preserve Bush's cuts. The Congressional Budget Office has estimated it would cost the government $2.3 trillion from between 2008 and 2017 if the expiring tax provisions were extended. McCain, who has a long record as a spending hawk, voted against Bush's 2001 tax cuts but now says they should be extended because doing otherwise would amount to a tax increase. Recently, the candidates have been challenged on the issue of the alternative minimum tax. Originally introduced in 1970 over concern that wealthy families were able to avoid paying federal income taxes, the AMT has never been indexed for inflation and has begun to snag millions of middle-class taxpayers. In a debate on economic issues last week, Thompson advocated indexing the AMT for inflation and phasing it out altogether over time. But that would cost the government $621 billion in revenue over the next 10 years, say the CBO and the Joint Committee on Taxation. Romney has said he would eliminate taxes on interest and dividends for families earning less than $200,000 annually, which the campaign says would cost $32 billion. Aides say it would be paid for through economic growth and by holding non-defense, discretionary spending to inflation minus 1 percentage point. Health Care: Giuliani, McCain and Romney have proposed making health care more affordable but have avoided assigning a price tag. McCain was the most ambitious of the three, focusing on cost containment, treating chronic diseases and providing tax subsidies to buy insurance. When he unveiled the plan last week, McCain acknowledged that he didn't know how much it would cost, but aides said it would be paid for by ending a provision in the tax code that lets employers deduct the cost of health care from their taxable earnings. Giuliani also offered no cost estimate for his health plan, which would provide tax credits to help individuals pay for insurance rather than relying on employers to do so. Romney has said his plan is revenue neutral. It would spend existing resources and reroute federal dollars to the states to cover the uninsured with private insurance. He has distanced himself from a major initiative passed in Massachusetts while he was governor that requires all residents to buy health insurance.